SmartBank imports Bank Statements straight into Multi Accounting packages...SAVING over 90% in CashBook processing TIME, COSTS and MONEY! 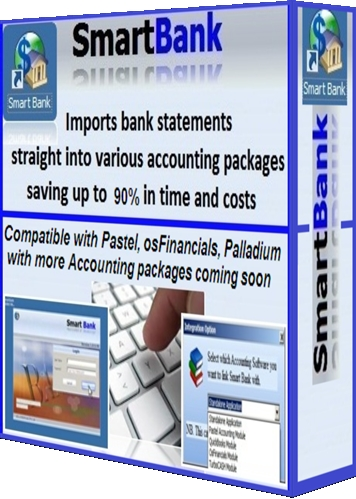 SmartBank is a lot easier to use than the Sage Pastel Bank Manager and works beautifully with:1) ALL Sage Pastel Partner and Xpress versions (2009 to 2017)2) OSFinancial Accounting (Free Accounting package)3) TurboCash V3, 4 & 54) Palladium Accounting coming soon!5) More Accounting packages coming soon! ...saves lots of Time and Money! SmartBank is the brain child of David Hartley, a professional accountant who began working with Pastel back in 1990, who has teamed up with a very bright professional programmer and partner, Sylvain Ntumba, who wrote most of the current version of TurboCash and OSFinancials while working in that field 5 years ago. David’s appreciation of the bookkeeping environment and his keen eye for the future has lead to the development of a package that finally integrates modern advancements in banking and technology in a way that will save both bookkeeping time and money for his clients. There are an estimated 180 000 Pastel users in South Africa, not to mention people using other bookkeeping software. SmartBank’s initial objective is to gain between five thousand and ten thousand active users. SmartBank also plans to expand internationally once he has managed to sell his first few thousand packages in South Africa. The SmartBank software is now owned by a company called SmartBank Solution (Pty) Ltd (2012/097293/07) with David Hartley and Sylvain Ntumba being co directors. 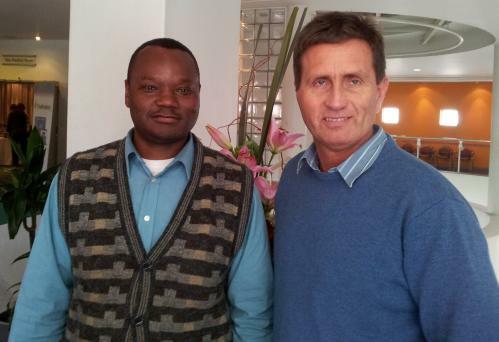 SmartBank will start operating from Cape Town with a Johannesburg based telephone support team. SmartBank plans to expand and grow valuable add on updates, tools and advancements that will make SmartBank simple to use in everyday life....saving the users lots of Time, Costs and Money! SmartBank Bank Manager, is a new Bank Manager tool that now competes with the Sage Pastel Bank Manager and works on ALL Sage Pastel Partner and Xpress versions including V17! The following Videos are SHORT but more detailed explanations of the quick walkthrough above. This SmarBank Bank Manager video show how easy SmartBank reconciles batches imported with and without overlapping transactions. This video also show how easily SmartBank exports the reconciled transactions straight into the Sage Pastel Partner and Xpress packages with a few clicks. The SmartBank Auto Allocation of recurring transactions video includes the "Searching for, "Deleting", "Exporting" and "Importing" of recurring transactions and more. In this video, SmartBank Bank manager walks through how easy it is to 1) Split a transaction and 2) SAVE a RECURRING transactions that needs to be AUTOMATICALLY SPLIT every month or more often...without having to remember the Splits ...what a pleasure!! This SmartBank video takes you through the steps on how to 1) Set-up the Default accounts and 2) how to use the "Fill blank accounts with Default accounts"
SmartBank Bank Manager works beautifully with BOTH OSfinancial Accounting and TurboCASH Accounting. 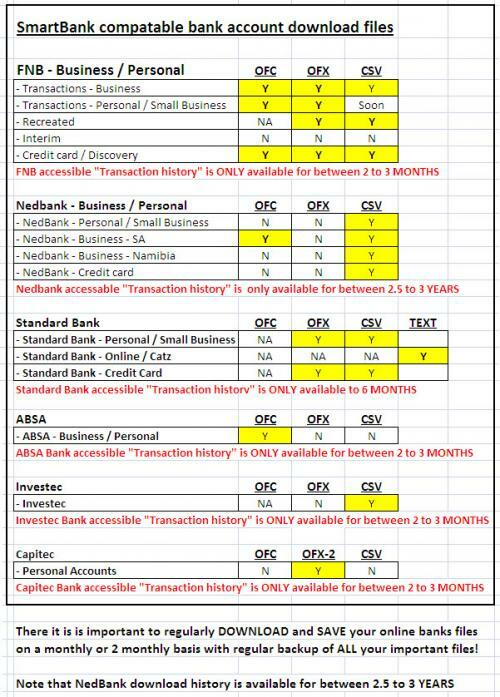 SmartBank imports the transactions, reads ALL the accounts in the other accountimg package and then EXPORTS the reconciled transactions straight into the accounting package...as easy as 123!! 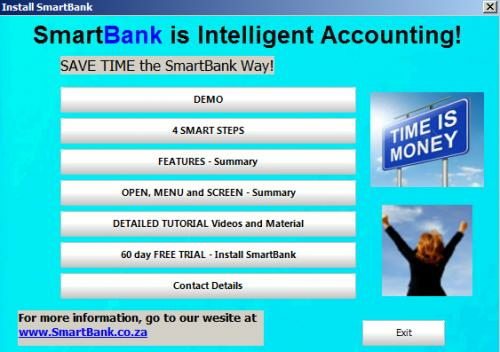 SmartBank's comprehensive Tutorial Video contains a full step by step walkthrough as summarised below. Please note that the SmartBank video CD will be mailed to all new customers FREE of charge.on registration of their SmartBank package. Palladium Accounting - Coming soon!! Please click HERE for more information on SmartBank's optional extra telephonic support. Please note that support is NOT INCLUDED in the above retail prices but, if the user manuals and training videos do not suffice, please contact us and we can, subject to what your needs and requirements are, negotiate win win agreed additional service and support rate. The SmartBank's base office is in Tokai, Cape Town in the Western Cape with a branch outlet in central Johannesburg. For further inquiries, please enter your details below and we will call you as soon as possible.